(16/21) TRENTON – With overnight temperatures in many parts of the state expected to continue to be near or below freezing for the foreseeable future, the Department of Environmental Protection and Department of Agriculture will conotinue to allow farmers to conduct controlled open burning or use specialized torches known as smudge pots to protect flowering crops from frost damage. Forecasts call for near-freezing temperatures in many parts of the state through at least the coming weekend, a situation that could affect fruit and vegetable crops, as well as flowers in bloom or near blom. Peaches, blueberries and apples are particularly susceptible. Frost damage now can significantly reduce yields of these crops later in the season. The DEP and Department of Agriculture are extending the allowing of open burns and use of smudge pots to protect farmers’ livelihoods and to ensure that consumers will be able to enjoy an ample supply of Jersey produce later this year. The use of these practices under certain conditions is being extended indefinitely. The DEP and Department of Agriculture last week initially announced the practices would be allowed through April 5, but forecasts call for persistent cold overnight temperatures. The use of smudge pots and controlled burns can help keep orchard and field temperatures just warm enough to avert extensive damage when frost danger is greatest. Frost threat is typically highest in the early morning hours before dawn, when there is little or no wind and skies are clear. New Jersey is among the nation’s leaders in blueberry and peach production. Blueberry production is focused in the Pinelands of Burlington County. 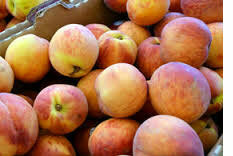 Peach and apple orchards can be found throughout more rural areas of the state.